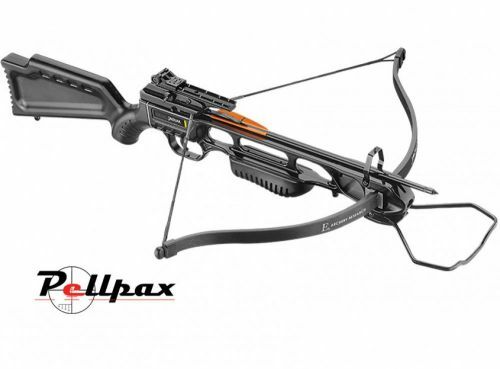 A great crossbow all round whether you're looking to start shooting or just upgrade your current crossbow. The Jaguar relates to it's name showing power, stealthiness and a deadly accurate shot each time. Having a aluminium/polymer build the jaguar is very robust and can withstand mild impacts. The stock with cheek piece ensures comfortable shooting and reduces user fatigue. Requiring only 150lbs to draw the crossbow can be used by a variety of age groups. Measuring 27" in width and 35" in length the crossbow is compact and therefore easy to transport. When shot it is capable of shooting up to 210FPS making it ideal for target shooting. Alongside the powerful crossbow you also get an adjustable peep sight for accurate shooting, Cocking rope, 2 x Aluminium bolts to get you started and some string wax.